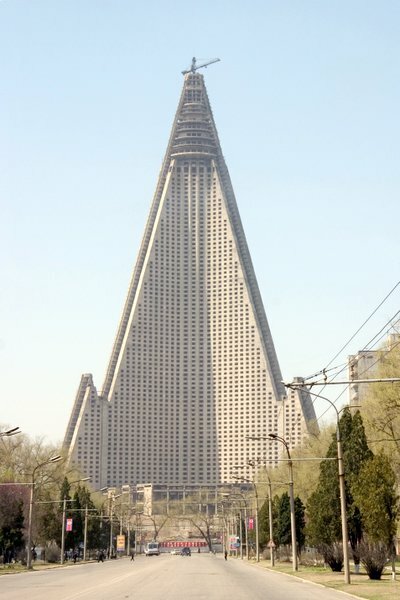 SEOUL — North Korea’s Ryugyong Hotel ranks among the world’s most remarkable — and mockable — buildings. It’s taller than New York’s Chrysler Building and wider at its base than an average city block. Constructed almost entirely of concrete, it looks like a rocket ship and casts a jagged shadow over Pyongyang’s gray vistas. But the Ryugyong has never opened for business, which is why, for years, outsiders have viewed it as an emblem of North Korea’s broader failures. Work began in 1987 on a structure envisaged as a 105-story showcase of prosperity. It ended just four years later, when the money ran out. The building had reached its planned height but was left as a hulking pyramid with glassless windows. For years, a single crane remained perched at the top, a stranded reminder of grand plans gone bust. Sometime this spring, though, according to the Yonhap news agency in Seoul, the Ryugyong Hotel will partially open — 23 years behind schedule. Initially, it might serve as an office complex, not a hotel, but eventually, travel agents say, the Ryugyong will open for tourists. As North Korea apparently intends it, the building’s completion marks the literal high point of a major push to spruce up the country’s capital and show off its self-described burgeoning economic strength. The reality is somewhat different: The North’s state-run economy barely functions, and its authoritarian government relied on outside investment from an Egyptian telecom company to complete the hotel. Still, the planned opening illustrates North Korea’s resourcefulness, particularly as the country prepares for a year of celebrations to commemorate the centenary of founder Kim Il Sung’s birth. Pyongyang still has the ability to wangle investment from outsiders, trading rare access to the North Korean market. (In the hotel’s case, support came from the Egyptian company Orascom, which is building a mobile network in the country.) Pyongyang also has the advantage of being able to use its people at will on its pet projects — including, according to reports from defector groups in Seoul, university students whom it reassigned to construction work. The hotel starts out with at least one major plus: It was famous long before its scheduled launch. When construction began, plans called for 3,000 rooms, five revolving restaurants, a bowling alley and a nightclub. The government featured the Ryugyong on official stamps. Pride dissipated along with the funding. Architects routinely described the unfinished structure as among the world’s ugliest; several years ago, Esquire magazine called it “the worst building in the history of mankind.” With neither the will to knock it down nor the money to complete it, North Korean authorities for years airbrushed it from some official photos of its skyline. Officials have not disclosed details of the new plans for the hotel. But Cockerell mentioned a “common rumor in Pyongyang” that many of the middle floors will be left vacant, with the bottom used for hotel rooms and the top for restaurants. upmanship with Seoul. As the South prepared to host the 1988 Summer Olympics, its capital underwent a high-rise boom that included construction of a 63-story, gold-clad building that was the highest in Asia. North Korea countered with the ­Ryugyong, almost 200 feet higher. At the time, the two economies weren’t so far apart, and the North — with aid flowing in from the Soviet Union — could afford occasional big spending projects. But the Soviet collapse in 1991 ended the flow of funds and also left the North short of raw materials. Over the years, the North tried several times to revive the project, once even turning to the South. In 2005, the South Korean port city of Incheon planned to host the Asian Athletics Championship, and the South wanted North Korean participation. The North bargained, saying it would send its athletes — if Incheon funded the Ryugyong. So a 100-person team from Incheon flew to Pyongyang for meetings. After the Incheon deal fell apart, Orascom agreed in 2008 to begin renovations. Construction workers affixed mirrored glass to the structure, and the building’s conical point came to look like a pen’s silver cap. Finally, one day, the crane disappeared. “It was the middle of 2009,” said Cockerell, who was in Pyongyang at the time. “It was a very foggy day, and you couldn’t even see the top of the building. But you could hear very loud helicopter noises. Very loud, and that’s not common in Pyongyang. About an hour later, the fog cleared, and there was no more crane on that hotel. Everybody was just staring at it.